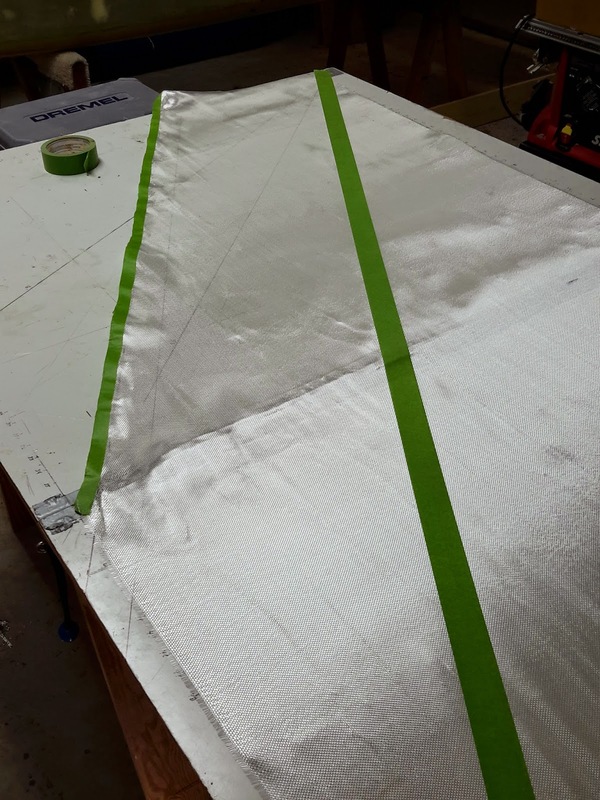 As bought, the strut doesn't have any way to attach it to the fuselage so you have to provide those by way of fabricating attachment tabs. Note to future builders...Don't rush these steps. Take your time, check and recheck measurements. 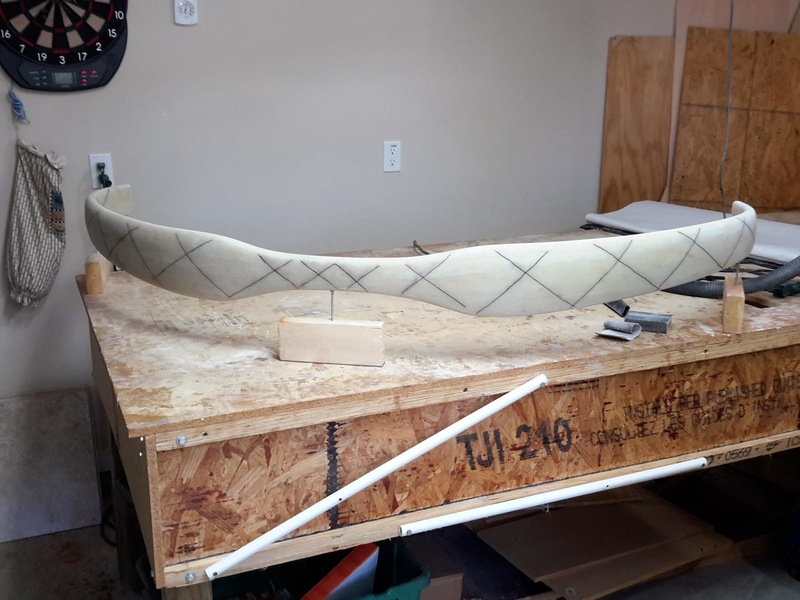 The more accurate you are on each of these steps, the easier job you'll have installing the strut into the fuselage and having everything line up with minimal adjustment. The first step is to build the jig. 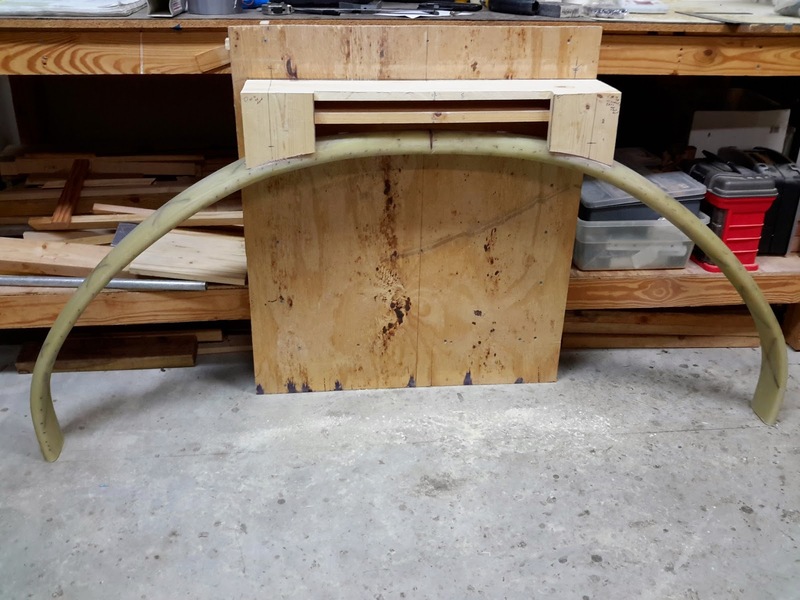 I built a perfectly vertical backboard and laid out the alignment marks that define the center line and location of the future attachment points. 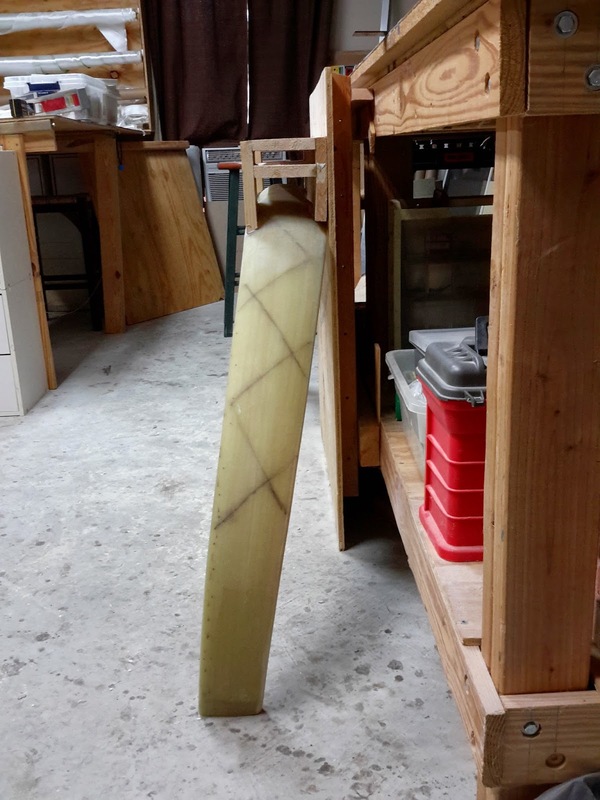 A check of the FAQs indicated that it is likely that one attach point location would be slightly higher than the other just because the strut may not be perfect or you may have had some variation in the thickness of the previous 8-ply layups. I had one side that was .1" higher. The FAQs say to use the higher of the two and match them. 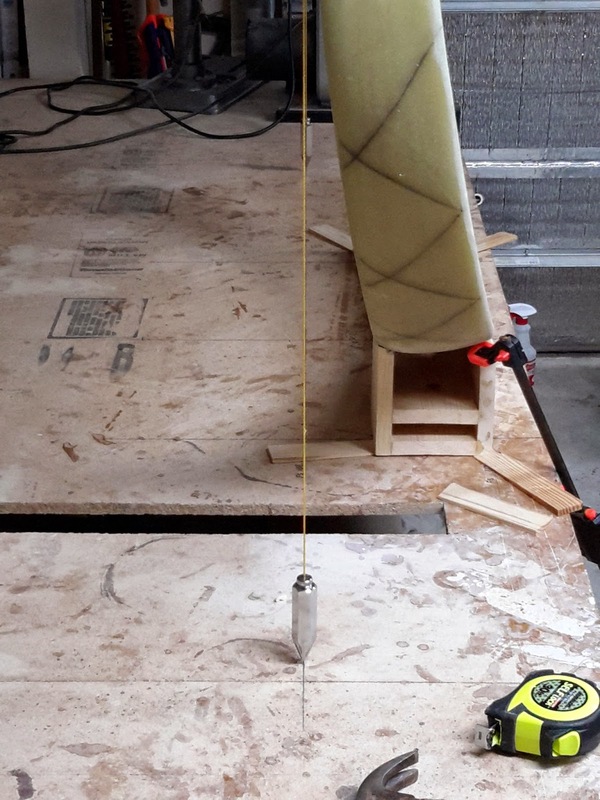 Now that the forward attach point located, I built the jig box per plans, bondo'd it to the strut, and transferred the points from the backboard to the jig.. This was pretty straight forward. Strut against backboard w/ Jig attached. Profile of Jig and strut sweep angle. up on the table top. With the jig built, I moved it to the work table and positioned it per the plans. After some shimming and leveling, the strut is aligned such that the LE of the strut falls exactly 9.25" in front of the back edge of the jig. This further aligns the strut and jig in such a way that all four attach points should be at the same distance above the table. This then allows you to locate the rear attach points based on the measurements of the front points you already located. LE at the right spot, and braces to help keep it there. This all looked complicated at first but it's actually pretty simple and I think rather ingenious. Now it's ready to build the attachment points. With the reinforcements out of the way, I'm back to preparing the strut. 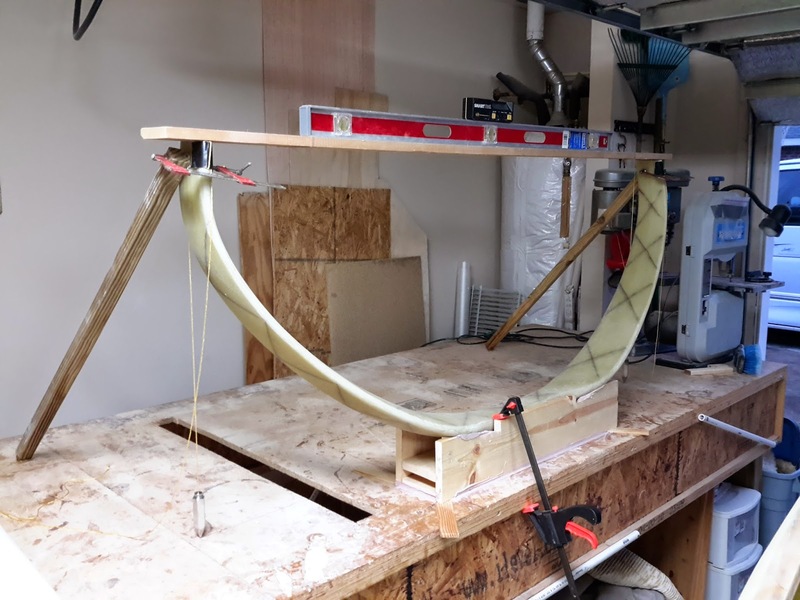 The next step is a 4 ply layup, ~35 degrees to the leading edge (LE), that provides the strut torsional strength that it doesn't have out of the mold. The entire strut is made of S-Glass with all the fibers laid in the same longitudinal direction. 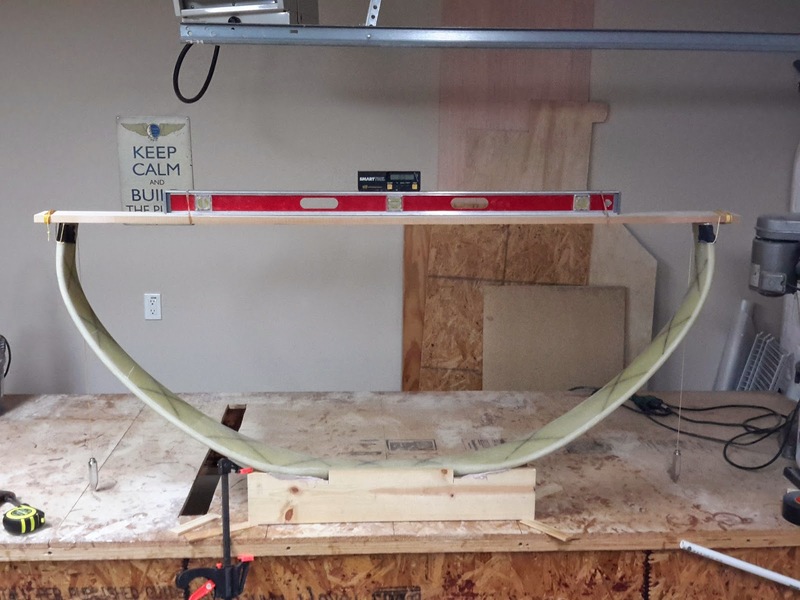 Without these layups over it, there's nothing to prevent twisting from landing loads. You can see my ~35 degree alignment marks in the picture. The glass runs from the LE up around the trailing edge (TE), and back down to the LE again...maintaining the 35 degree angle. This layup took me a lot more time than I thought it would. What I estimated to be a 4 hr job took me 7 hrs just to get the first three ply's laid down. At that point I was so tired I decided to peel ply and finish the last layer another day. My difficulty was getting the long pieces of glass running the correct direction while at the same time ensuring there was enough on each side of the strut to cover it. The first layer wasn't bad because I could get it in place on the strut and then raise it a little at a time to put epoxy under it. After the first layer though the remaining epoxy was sticky and made it very difficult to get the glass laid correctly. I came back in the next couple of days and finished the job with that last layer. A Place for Brake Lines...or Maybe Not. Next the plans have you flip the strut over and install tubing for brake lines at the TE. I skipped this task because I'll be installing gear leg fairings from Eureka CNC. 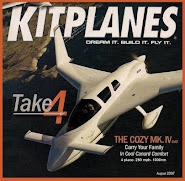 They provide a more efficient airfoil around the gear legs which reduces drag. It is expected that you can pick up ~3 knots with these. The prefabbed fairings have a cutout for the brake line conduit already built in. Now four more ~35 degree layups...these wrap from the TE up over the LE and back down to the TE again. (TIPS) I did three things different this time. First, I used 15" wide strips of glass and I marked them with tape, cutting down the middle. The tape keeps them from unraveling at the edge. I cut the tape off once it was laid up on the strut so I could adjust groups of fibers individually. 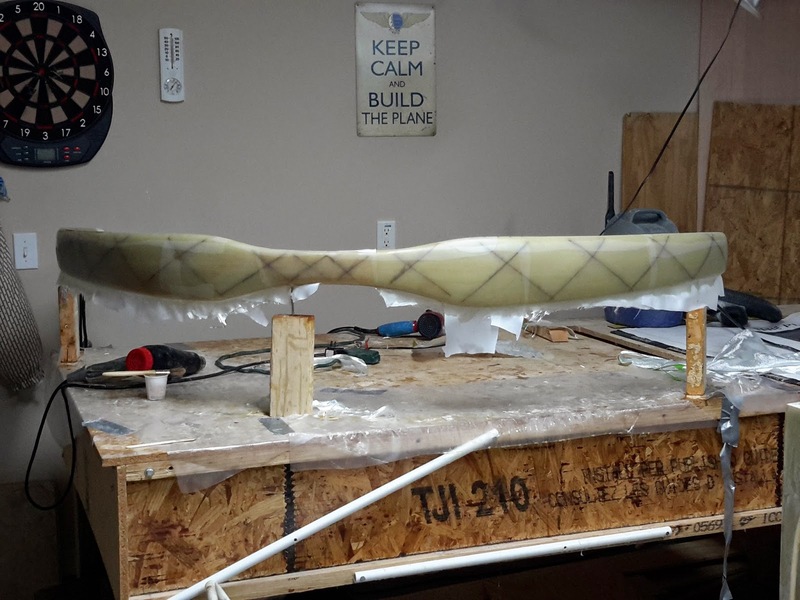 Second, I raised the strut which put it at a more comfortable level to work on and allowed me more room to deal with the glass wrapping underneath. I still couldn't get to the 1/8" gap the plans want you to try to achieve. Frankly, I don't see how anyone can do that. I did the best I could and then sanded the rough edges I had to a nice fade into the strut. And third, I made sure to apply fresh epoxy right before each subsequent ply after the first.. This allowed the glass to be moved around easier to get it aligned correctly without sticking to the previous ply. 2nd set of 4ply layups complete, peel ply on.....Wheeew! !